I briefly had a Navman S80 Deluxe (S80D) GPS, which I bought from Halfords in the new year sales. Note: The S80 and S80D are not the same model, nor is the Deluxe an enhanced version of the S80. 2/10 - Lots of good features, however they are let down by poor documentation, software, voice and traffic capability - nice wallet though. I got the bundle from Halfords. The bundle contained the Navman unit itself, a CDROM a tome of a license agreement, a windscreen mount and power cable, a TMC traffic cable, a USB cable and a case. The device iself is made of plastic (as most are), with a clean symmetrical shape, but with quite a tacky feel. Although the box said it came with a bag, it actually came with a really nice leather wallet with a magnetic latch. The screen mount adaptor connects well to the screen, and the GPS needs to align with a platic fin, which it slides down before connecting at the base. The power cable has a large 12V plug at the other end. The device enables you to select your destination by postcode or by address. The database seems quite complete, and a voice speaks the letters as you press them. When on the road, a small button on the screen enables the display to toggle between 2D, 3D, Route, Traffic and Step-by-step. The 3D route orients itself to the direction of travel, whereas it is possible to force the 2D view to orient itself due north. I had some cases when I toggled through these views, when it came back to the 3D view, and the screen no longer scrolled with you in the centre, and you slowly drove off the edge of the screen. Switching the device off and on, and re-entering your destination seemed to fix this. When approaching roundabouts, there is a large image in the top left of the screen, showing you a clear and precise picture of the roundabout, showing you your exit. When driving along the road, there is an exact image of the next junction at the bottom left of the screen. The screen can also display Time / Distance to go, Time / Distance to next junction, Estimated time of arrival. The ETA seemed quite accurate. I used the device with the 2007 maps - it came with a free upgrade to the 2009 ones, and I registered and sent off the email, but the automated system never sent back a confirmation. The 2009 maps are due for release some time in the middle of the year. Having said that, the map I used seemed quite accurate, for example, I never came to a roundabout where the GPS though that there were more or fewer junctions that in reality (a failing of many GPSs). There is a patch between the A1 and Cambridge which is shown as hatched on the map - I have no idea what this is, but it did have difficulty calculating a route when in this area, telling me to get to a road, when I was blatently driving down one. The S80 GPS has its moments. If you switch the device off with a short soft-off press on the power switch, it locks on pretty quickly after being turned back on. If it has been re-started from scratch, it takes a while to lock on, and invariably asks you if you are indoors 4 minutes after leaving your house. The S80 comes with a TMC traffic cable - I never actually got this to work. The documentation tells you that the speaker connector is a speaker/traffic connector, but if you plug the cable in there, not only does the traffic system never detect a signal, but the speaker no longer works. The S80 also comes with a separate base unit, which takes the charger cable. There is also another jack socket with an image of a microphone on it - the TMC system doesn't work if you use this socket either. In fact, there are 3 sockets to choose from, and none of them allowed me to get a TMC data lock in 2 weeks. The S80 can connect to a phone and also a bluetooth headset. The phone interface allows you to use it as a hands free system, however, if it did enable you to use the phone's voice dialling, I never found out how. I could not send VCard entries across from my Nokia mobile phone, and couldn't work out how to make use of the address book. These features together made the hands-free features pretty useless to me. The documentation for the S80 left much to be desired - there is a quick-start guide, which tells you to plug the TMC cable into the wrong hole (I presume), and the biggest document you get is a license agreement. This is because, under the bonnet, the GPS is running a Microsoft operating system - how do I know this (well, I didn't read the license agreement) - when I tried to perform a firmware update patch, I downloaded a 34Mb file, and after seeing some Microsoft error messages on the device's screen, the update eventually gave up - I never did manage to install Service Pack 1. The device has a PIN capability, so that you can protect your details in the GPS. This is a great idea, but as with many of the other features, leaves a little to be desired. The PIN must be set by connecting the device to a PC - hopefully this means that if the device is stolen, nobody can get the details out of it. Unfortunately, I soft-started the device several times, and it did not ask me to enter the PIN before working. An intermittant PIN is of no use to anyone. The device does not say anything on the box about Text to Speech, however, if you do a search on the internet (navman Website) for the S80, you will see examples showing it saying "Turn Left into Wallace Drive" etc. I never heard any of this. checking the documentation, and it does not say that it supports Text to Speech, so I checked the Halfords website, and there is a question to which the Halford response is "Yes this does have TTS - we will update our documentation / website". Well, I took the device back to Halfords because of the non-functional Text to Speech, and non-functional TMC traffic. They first told me that it wasn't supported, and after looking at the website and phoning head office, told me that it should be, but I needed to install the 'Kate' voice, which neither they nor I could find on the CDROM. I ended up asking for a refund, and I went on to buy a Tom Tom Go Live 540, which Ive now had (and am keeping!!!) for a month - review coming soon. The Navman S80 is no longer stocked by Halfords. 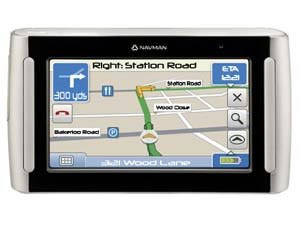 The Navman website states that the GPS comes with Tele Atlas map data 2007.4, but I suspect a free upgrade to the latest map would still be on the cards. If you do find a retailer, it may be worth checking this out. I too have been very confused about the S80 and S80 Deluxe. I guess that it is the computer generated voice that enables street name speaking, and the English voices do not support speech synthesis, whereas, the Australian 'Kate' voice does. I HAVE ALSO JUST INSTALLED THE LATEST MAPS WITH NO PROBLEMS, JUST FOLLOW THE INSTRUCTIONS. REGARDING THE TEXT TO SPEECH, THE MANY REVIEWS I READ ON THIS DEVICE STATED IT DID NOT INCLUDE THIS ABILITY, BUT EACH TO THEIR OWN I SUPPOSE! the screen view is good and the screen interface is good. I have had the S80 for about 10 months now and the mapping is as good as any TomTom I have used. The TMC only seems to work if you ensure the the hole in the end of the cable is facing out of the windscreen. The bluetooth works well, however I could never get the contacts from my blackberry, but since changing to a Sony this now works. I am waiting for the email regarding the free map upgrage. My advice is don't wait for the free upgrade, because it wont arrive! I am still chasing for my 2009 map upgrade and was informed that I was recorded as having registered for 'sales' e-mails and not the map upgrade registration, even though I did it via the NavDesk CD. I was then informed that all the free upgrade maps had gone, but they would see what they could do and I have been given a link to 'MioMore' - does this mean anything to anyone? Other than that, I am quite happy with the S80. my navman, just dies, i think its cos my dad used the wrong voltage car power supply on it, does anyone have any suggestions? is there a boot menu i can put it into to restore factory settings, she just wont power on captain..